Last year ArtInfo ran a post called “The 10 MFA Programs That Give You the Most Bang For Your Buck” and I was surprised that University of Connecticut (my alma mater) wasn’t at the top of the list. Here’s why it should be. Halfway between New York City and Boston, UConn is located in the lovely pastures and cow fields of central Connecticut. The rural location may seem like a negative, but in fact, living outside of a major metropolitan area means fewer distractions (and insidious influences), lower rent, and enormous, private studio spaces with natural lighting. As far as the faculty goes, the professors are pretty accomplished–Guggenheim Fellowships, Fulbright Scholarships, Getty Foundation Grants, National Endowment for the Humanities and the Arts Grants–and engaged with the students and with their own studio practices. For the past two years, I’ve led the fall semester Grad Seminar, participating in mid-term and final critiques, and I’m constantly impressed by the level of dialogue and commitment among both the students and faculty. 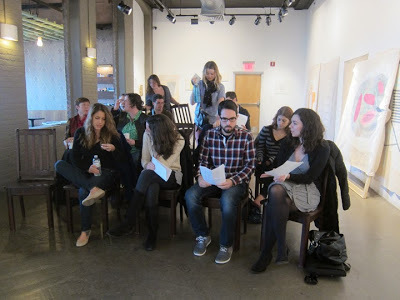 [Image above: Class of 2013 MFA students preparing to read the artists’ books they created in my seminar during Open Studios at Real Art Ways in Hartford, CT) The program culminates in a thesis exhibition at the William Benton Museum and at a gallery in New York. Last year the show was at Sideshow in Brooklyn. 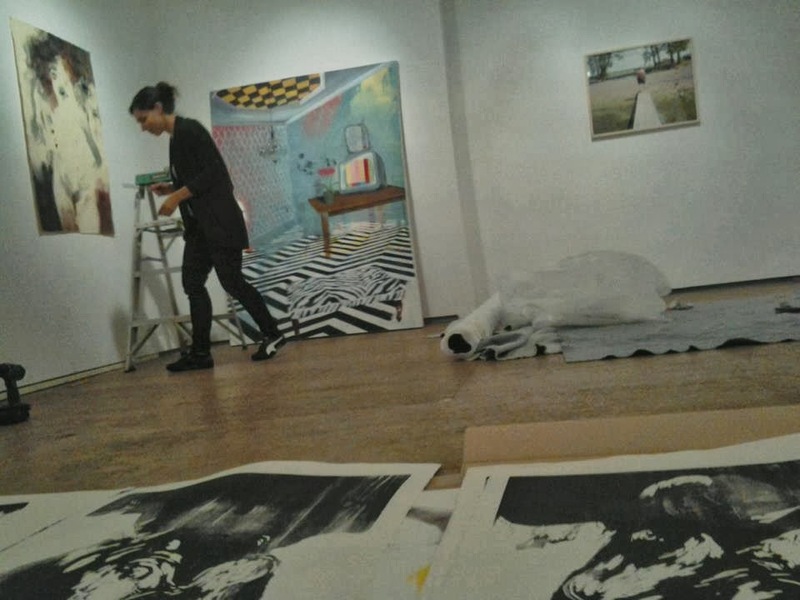 Students installing their work at Sideshow. Image courtesy of 2013 grad Kathleen Deep. 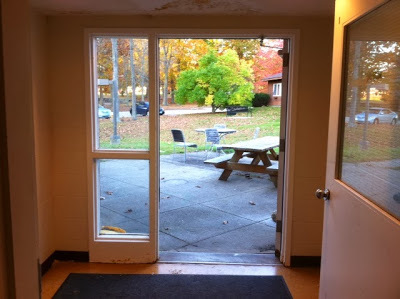 The Visual Arts Resource Center (“the VARC”) comprises two buildings and houses studios (above) for ten grad students. 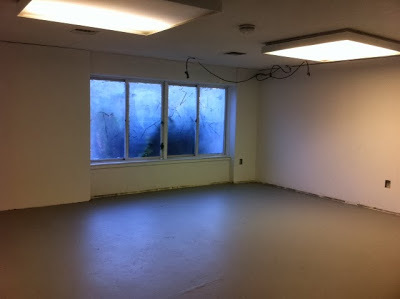 Overflowing with space, the VARC is big enough so that each student can use one studio to work in and another room to install and display work in progress. Image courtesy of 2013 grad Allison Hale. Barbeque and picnic area at the VARC. Image courtesy of Allison Hale. But here’s the most astounding and progressive thing about the program. In addition to unparalleled studio space and one-on-one mentoring, each student (five are accepted each year) gets a tuition waiver and a generous fellowship for a teaching or gallery assistantship. In other words, students can earn an MFA from a top research institution without incurring any student loan debt. For artists, unlikely to find a full-time teaching job for several years, this is extremely important. Graduating debt-free means they have the financial freedom to spend more time in the studio during the critical post-graduate period. The deadline to apply is January 15, 2014. For a tour of the campus and facilities, contact MFA Grad Program Director and Professor Judith Thorpe (Email: Judith_Thorpe@uconn.edu, Phone: 860-486-4417). UConn is a friendly place–Judith told me she would be happy to meet with all prospective applicants and show them around. Spread the word. Another great program debt-free is University of California Davis- no debt, tuition waivers, money for teaching, big studios, etc. Very close to the Bay Area! Northwestern is great!!! Didn't owe a dime after getting my MFA. I went to UCONN for my BFA and loved the program. Now I am at University of Georgia, which is a larger grad program compared to CT, but they also give a large amount of tuition waivers/assistantships. I will come out debt free after 3 years, and will have taught three semesters. Athens is a cool town too. SUNY Purchase MFA. Such a great program. Challenging and the opportunity to earn dual degrees MFA/MA. State school means low cost. Connected to NYC Art scene, faculty, visiting artists, etc. Applications are on the rise as schools in the city become cost-prohibitive. I was lucky to be admitted before the secret was revealed.